While he speaks, he ambles through an unassigned storage space in East Harlem’s MANEAST 11 sanitation garage. But in place of massive garbage trucks -- the room’s typical cargo -- the cavernous space is littered with framed movie posters, bronze teapots, and long out-of-tune guitars. 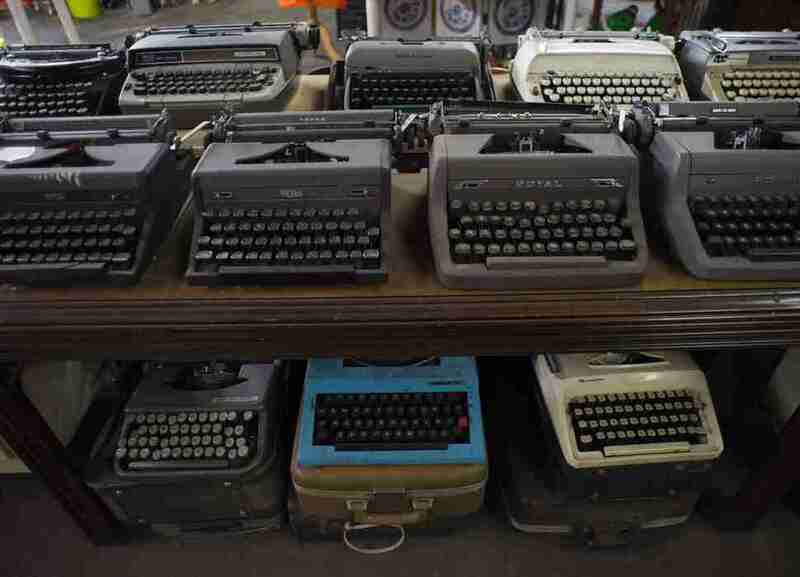 Across from the entryway, defunct typewriters sit in a row atop a closed grand piano, an open book of sheet music still resting on the music stand. A beady-eyed Santa Claus statue grins up from a thicket of tinsel-laden plastic Christmas trees. Below exposed brass piping on the crumbling brick wall hangs a series of canvas portraits, each marked with same initials on the bottom right. 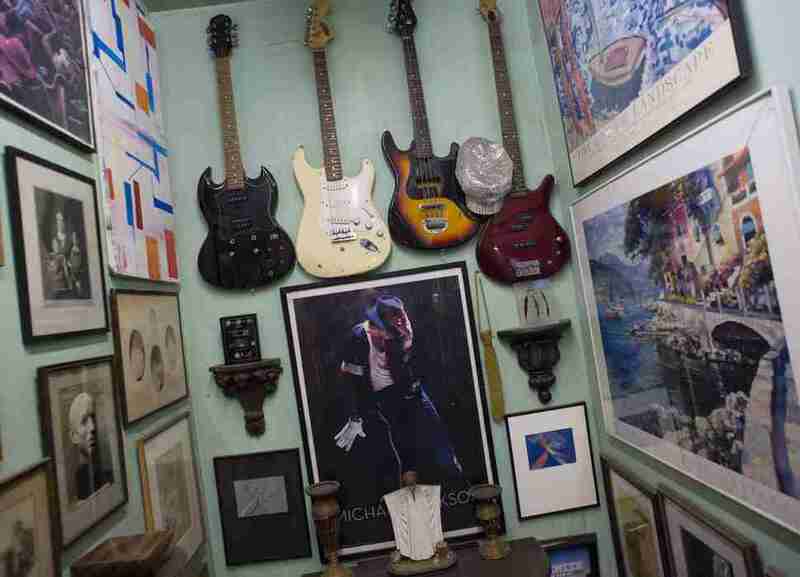 The garage-turned-gallery has housed this impressive spread of mismatched relics since 1981. Make an appointment to visit, and Molina will walk you through the stacks himself. “Let me know if I can help,” he tells me shyly at the outset of my tour, standing to the side as I wander his cluttered domain. He is not small, but in his short-sleeve button-down, hands clasped behind his back, he resembles a boy patiently waiting to be excused from the dinner table. Careful not to overturn any of the fragile, haphazardly placed items, I pick my way through rows of violins resting in their velvet cases, beneath shelves lined with rosaries and old photographs. A framed Harvard MBA hangs beside one of the grated windows. Sheets of preserved stained glass, encased in the dizzying halogen light of old lamps, splash the gritty cement floor with muted yellow light. Compiled, it is a weird and wonderful New York history, dictated in trash. 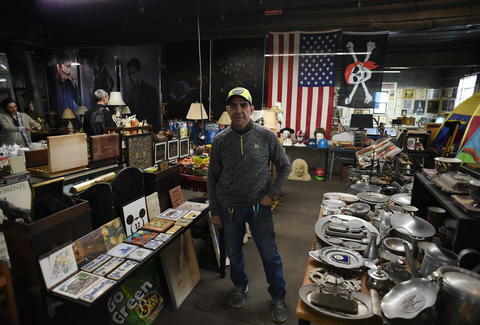 The Sanitation Department forbids its workers from taking home the things they find along their trash routes, so when Molina began to salvage his stockpile of sidewalk artifacts, he kept them in the locker room on the second floor of MANEAST 11. Colleagues soon followed suit, adding trinkets and treasures they discovered, until the collection outgrew the locker room and was relocated to a larger, unassigned space in the garage. “It wasn’t a job for me, the collecting -- it was just a thing I did,” Molina says. “I guess I just couldn’t stop.” Even as the assemblage expanded, Molina had final say over what was displayed -- he was, and is, the presiding curator. “I’ve got these sensors that go off,” Molina says. “I’ve developed an instinct, based on the weight and the shape of things.” Over these 30 years, he’s become attuned to the way picture frames protrude from white plastic Glad bags, or the distinct rattle of ceramics against old bottles. The man has a gift. From the gallery’s early years through Molina’s retirement in 2015, his garbage route ranged from 96th to 106th Street, between First and Fifth Avenues. Nearly all of the items in the collection were salvaged from that particular patch of the city. “It’s a wealthy neighborhood, especially on the East Side,” Molina tells me. “So you know they got good stuff.” Stationed on 99th Street between First and Second Avenues, the decrepit garage is an outlier among the area’s stately homes -- a blue-collar neighbor in the realm of black cars and townhouses. Lucky for Molina, old New York money begets something marvelous: the trash of the elite. The objects here are not classified by date or country of origin; broken projectors and framed finger paintings collide with bronze statues and antique china. The organizing principle is wonderfully fickle. Everything goes where Molina thinks it looks best. This past year, Open House New York Director Gregory Wessner hosted a tour of Molina’s museum as part of the organization’s Getting to Zero event series. The yearlong project focused on the life cycle of NYC trash: what we dispose of, and what becomes of it. “Only in New York would we have a sold-out tour of a sanitation garage full of discarded items on a Sunday,” Wessner said at the event. The out-of-the-way, appointment-only space still manages to draw a steady stream of curious spectators. Molina continues to lead two or three tours a week, perhaps even reintroducing visitors to objects they junked long ago. Over the years, the brick and cement supports in MANEAST 11 have begun to decay. The building is no longer structurally sound enough to house the heavy-duty sanitation trucks it once held; the garage has lost its practical purpose. The gallery’s fate is uncertain. Still, the precariousness only adds to its charm. There is no easy come in New York, but we all perch on the brink of easy go. “I’ve lived in this city my whole life, and I’ve seen it change so much,” Molina says. “It’s hard to remember what it was even like a few years ago.” For now, the place stands as a fragile portrait of New York -- crowded, nostalgic, tenuous, tenacious. This, in a sense, feels like the revelation of this menagerie. The city will throw all of us out at some point. Yet even the discards become part of the fabric of New York, part of the story. I watch Molina as he aligns the handles on a row of ceramic tea cups, humbly presiding over the New York narrative he has given shape to: a people explained in their debris. Email tours@dsny.nyc.gov to request your own tour of the Treasures in the Trash Museum. Eliza Dumais is both a writer and a pack rat. Follow her @elizadumais.